Keyboard Accordion, labeled Imperator, c. 1930's, full size, probably American, black-grey pearloid finish. Here's a very festive full-size 120 bass piano accordion, probably made in a small American shop sometime in the 1930's. The only markings on the instrument are the words "Imperator" and "Hand Made" incised into the grill and the name "Misty Ko__tra" (?) handwritten in white ink on the inside of the treble side. 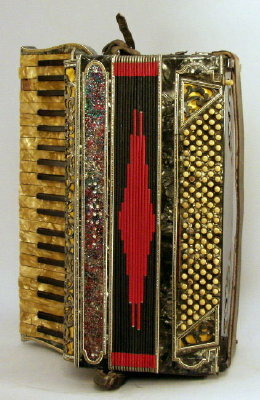 "Imperator" seems to have been a popular model designation in the accordion industry. At one point or another, Hohner, Serenellini, and other leading manufacturers have issued models called "Imperator." However, there is no indication that this instrument was manufactured by a known company. Dressed to the nines in rhinestones and multicolor glitter, with all the razzle-dazzle of a vaudeville marquee, this "Stomach Steinway" might have been a professional performer's instrument. Perhaps the mysterious "Misty" played it in nightclubs, theaters, and/or on the wedding/party circuit. While we may never know the real story behind this musical artifact of a bygone era, it's still fun to speculate! The accordion features: a 19.2 inch keyboard with 41 treble keys, 120 bass/chord buttons, four sets of treble reeds and three sets of bass/chord reeds, two hand switch treble registers along the outer edge of the right-side piano keyboard and one bass/chord register in the center of the top trim of the left hand side, and a wood body covered in black-grey pearloid "mother-of-toilet-seat" veneer. Particularly noteworthy are the needle gauges for the registers (two for the treble side and one for the bass/chord side). Each one has a clear plastic window framed in silver glitter with a red-tipped arrow in the center. The gauges' spectrum ranges from the letter "F" to the letter "P." The "F" probably stands for "forte" (loud), while "P" might indicate "piano" (soft). Height is 7 1/2 in. (19 cm. ), 20 1/2 in. (52.1 cm.) width, and 15 1/2 in. (39.4 cm.) in depth, measured from center of top to back. To be sure, this instrument has seen better days: the gauges don't work, the mother-of-toilet-seat cover on the lowest "G" key is coming off while the one on the low "A" is missing a piece, and the plastic veneer that frames the bass/chord buttons in coming up in the center, interfering with the buttons' operation. On a positive note, there are no leaks in the bellows and the actual reeds look to be in good shape. Let's cut to the chase: this instrument needs some serious restoration in order to make it playable. That said, we offer it as a collector's item and a decorative display piece. For the accordion hobbyist, it can be a worthwhile "fixer-upper" project. Sold as is, condition as described.